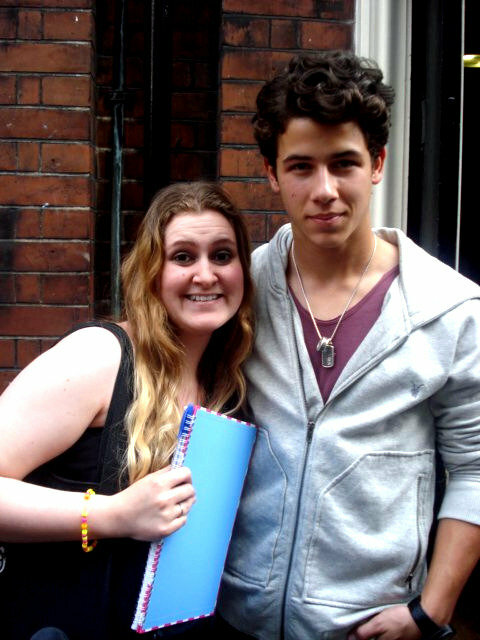 On the 17th June 2010, Nick Jonas was to be rehearsing for his up coming show in the West End- Les Miserables. Knowing my best friend was such a huge Nick fanatic, I offered her the chance of meeting him at the stage door knowing fully that that's where people featured in the shows tended to go. When we arrived, it was already absolutely packed. Girls covered every area of London, it was insane. At around 4pm, Nick's bodyguard Big Rob came out and announced that Nick would be coming out within an hour so as long as we were all quick and polite, he'd do photos and autographs etc. In the mean time, I met DJ Talent (Britain's Got Talent contestant) and Lucie Jones (X Factor runner up). Lucie was absolutely lovely and absolutely stunning in person. Next it was my time. Nick was a little distracted and seemed to be looking around as if searching for something. In the end, I tapped him gently and asked if he was okay as he was behaving strangely. All of a sudden, Nick shot round and said in one long bundle of words 'hey, how you doin'?' I did laugh out loud. He was so petrified of me for some reason. Once we left, my best friend ended up meeting him many many more times and I'm sure that they weren't the last."